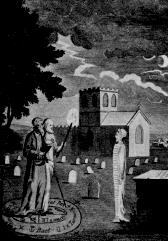 John Dee and Edward Kelley evoking a spirit: Elizabethans who claimed magical knowledge. Magic, sometimes known as sorcery, is a conceptual system that asserts human ability to control the natural world (including events, objects, people, and physical phenomena) through mystical, paranormal, or supernatural means. The term can also refer to the practices employed by a person asserting this influence, and to beliefs that explain various events and phenomena in such terms. In many cultures, magic is under pressure from, and in competition with, scientific and religious conceptual systems. Although an effort is sometimes made to differentiate sorcery from magic performed for entertainment value by referring to sorcery as "magick," this article will consistently use "magic" in referring to sorcery. Magic has been used throughout history, in attempts to heal or harm others, to influence the weather or crops, and as part of religious practices like shamanism and paganism. While magic has been feared and condemned by those of certain faiths and questioned by scientists, it has survived both in belief and practice. Practitioners continue to use it for good or evil, as magic itself is neither; but only a tool that is used according to the purpose of the one who wields it. The efficacy of magic continues to be debated, as both religious adherents and scientists find difficulty understanding the source of its power. Fundamental to magic is unseen connections whereby things act on one another at a distance through invisible links. Magic is thus distinguished both from religion and science: From religion in that magic invokes spiritual powers without presuming any personal relationship with spiritual or divine beings, merely an ability or power to bring about particular results; and from science in that magic offers no empirical justification other than its efficacy, invoking a symbolic, rather than actual, cause-effect relationship. While some deny any form of magic as authentic, those that practice it regard the influencing of events, objects, people, and physical phenomena through mystical, paranormal or supernatural means as real. The fascination that magicians hold for the public reflects a longing to understand more than the external, physical aspects of the world and penetrate that which could give deeper meaning, the realm of spirit and magic. The word magic derives from Magus (Old Persian maguš), one of the Zoroastrian astrologer priests of the Medes. In the Hellenistic period, Greek μάγος (magos) could be used as an adjective, but an adjective μαγικός (magikos, Latin magicus) is also attested from the first century (Plutarchus), typically appearing in the feminine, in μαγική τέχνη (magike techne, Latin ars magica) "magical art." The word entered the English language in the late fourteenth century from Old French magique. Likewise, sorcery was taken in c. 1300 from Old French sorcerie, which is from Vulgar Latin sortiarius, from sors "fate," apparently meaning "one who influences fate." Sorceress appears also in the late fourteenth century, while sorcerer is attested only from 1526. The Indo-European root of the word means “to be able, to have power”—really a verb of basic action and agency. The belief that influence can be exerted on supernatural powers through sacrifice or invocation goes back to prehistoric times. It is present in the Egyptian pyramid texts and the Indian Vedas, specifically the Atharvaveda ("knowledge of magic formulas"), which contains a number of charms, sacrifices, hymns, and uses of herbs. It addresses topics including constipation, disease, possession by demons, and the glorification of the sun. The roots of European magical practice are often claimed to originate in such Greek or Egyptian magic, but other scholars contest this theory, arguing that European magic may have drawn from a generalized magical tradition, but not from Egyptian magic specifically. In Europe, the Celts played a large role in early European magical tradition. Living between 700 B.C.E. and 100 C.E., Celtics known as Druids served as priests, teachers, judges, astrologers, healers, and more. Rituals were often connected with agricultural events and aspects of nature; trees in particular were sacred to the Celts. Over time, the Celtic beliefs and practices grew into what would become known as Paganism, mixed with other Indo-European beliefs, and became part of a set of beliefs and practices that were known collectively as "witchcraft." These practices included the concoction of potions and ointments, spell casting, as well as other works of magic. The Middle Ages were characterized by the ubiquitousness and power of the Catholic Church. In the beginning of Europe's conversion to Christianity, religious practices and beliefs were often appropriated and Christianized; for example, Christian rites and formulas were combined with Germanic folk rituals to cure ailments. Christian relics replaced amulets, and tales were told of the miracles these relics wrought. Churches that housed these relics became places of pilgrimage. Magic coexisted, often uneasily, with Christian theology for much of the early Middle Ages. By the fifteenth century, magicians were persecuted, as magical rites and beliefs were considered heresy, a distortion of Christian rites to do the Devil's work. Magicians were accused of ritualistic baby-killing and of having gained magical powers through pacts with the Devil. Despite this widespread condemnation of magical practice, a great number of magic formulas and books from the Middle Ages suggest that magic was widely practiced. Charms, amulets, divination, astrology, and the magical use of herbs and animals existed, as well as higher forms of magic such as alchemy, necromancy, astral magic, and more advanced forms of astrology. Magic also played a role in literature; most notably in the Arthurian romances, where the magician Merlin advised King Arthur. Grimoires, books of magical knowledge, like The Sworn Book of Honorius, provided instructions on the conjuring and command of demons, among other information. The Renaissance saw a resurgence in occultism, which was saturated with the teachings of hermeticism, which, along with Gnosticism and Neo-Platonism, has formed the basis of most Western occult practices. Heinrich Cornelius Agrippa, a German born in 1486, was widely known for his books on magic and occultism. Most famous for his work De Occulta Philosophia (Occult Philosophy), Agrippa was an opportunist who mixed with royalty, founded secret societies, and went to debtor's prison. 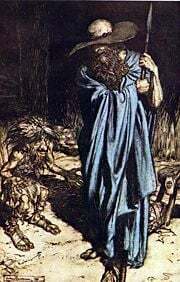 Even before his death, stories circulated about his prowess as a black magician, some of which were used by Goethe as inspiration for the title character of his play Faust. 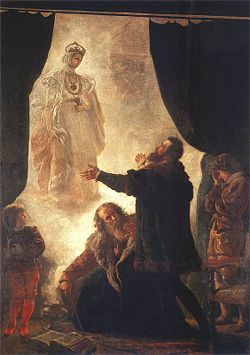 Pan Twardowski summoning the ghost of Barbara Radziwiłłówna for King Sigismund Augustus, by Wojciech Gerson. With the Industrial Revolution, on the other hand, there was the rise of scientism, in such forms as the substitution of chemistry for alchemy, the dethronement of the Ptolemaic theory of the universe assumed by astrology, and the development of the germ theory of disease. These developments both restricted the scope of applied magic and threatened the belief systems it relied on. Additionally, tensions roused by the Protestant Reformation led to an upswing in witch-hunting, especially in Germany, England, and Scotland. The twentieth century saw a dramatic revival of magical interest, particularly with the advent of neopaganism. Aleister Crowley wrote a number of works on magic and the occult, including the well known Book of the Law, which introduced Crowley's concept of "Thelema." The philosophy of Thelema is centered around one's "True Will;" one attempts to achieve the proper life course or innermost nature through magic. Thelemites follow two main laws: "Do what thou wilt," and "Love is the law, love under will." Crowley also advocated ritual and astral travel, as well as keeping a "magical record," or diary of magical ceremonies. Crowley was also a member of the magical fraternity The Hermetic Order of the Golden Dawn, an organization that had a great deal of influence on western occultism and ceremonial magic. In 1888, freemasons William Westcott, William Woodman, and Samuel Mathers founded The Hermetic Order of the Golden Dawn, a secret organization that was to be highly influential on the western practice of magic. The Golden Dawn was very organized, with rituals and defined hierarchy, and attempted to structure a functional system of magic. Members, particularly Mathers, spent a great deal of time translating medieval grimoires, writing material that combined Egyptian magic, Greco-Egyptian magic, and Jewish magic into a single working system. The Order taught astral travel, scrying, alchemy, astrology, the Tarot, and geomancy. Members attempted to develop their personality through their higher self, with the goal of achieving god-like status, through the manipulation of energies by the will and imagination. As might be expected, the large egos of many members created arguments, schisms, and alleged magical battles between Mathers and the Aleister Crowley. In 1903, William Butler Yeats took over leadership, renaming the group "The Holy Order of the Golden Dawn" and giving the group a more Christian-inspired philosophy. By 1914, however, there was little interest, and the organization was closed down. In 1951, England repealed the last of the Witchcraft Acts, which had previously made it against the law to practice witchcraft in the country. Gerald Gardner, often referred to as the "father of modern witchcraft," published his first non-fiction book on magic, entitled Witchcraft Today, in 1954, which claimed modern witchcraft is the surviving remnant of an ancient Pagan religion. Gardner's novel inspired the formation of covens, and "Gardnerian Wicca" was firmly established. The atmosphere of the 1960s and 1970s was conducive to the revival of interest in magic; the hippie counterculture sparked renewed interest in magic, divination, and other occult practices such as astrology. Various branches of Neopaganism and other Earth religions combined magic with religion, and influenced each other. For instance, feminists launched an independent revival of goddess worship, both influencing and being influenced by Gardnerian Wicca. Interest in magic can also be found in the New Age movement. Traditions and beliefs of different branches of neopaganism tend to vary, even within a particular group. Most focus on the development of the individual practitioner, not a need for strongly defined universal traditions or beliefs. A magician is a person who practices the art of magic, producing desired effects through the use of spells, charms, and other means. Magicians often claim to be able to manipulate supernatural entities or the forces of nature. Magicians have long been a source of fascination, and can be found in literature throughout most of history. "The giant Galligantua and the wicked old magician transform the duke's daughter into a white hind." 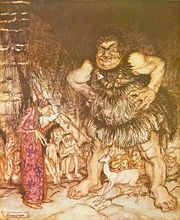 by Arthur Rackham; an evil wizard from the fairy tale Jack the Giant Killer. Wizards, magicians, and practitioners of magic by other titles have appeared in myths, folktales, and literature throughout recorded history, as well as modern fantasy and role-playing games. They commonly appear as both mentors and villains, and are often portrayed as wielding great power. While some magicians acquired their skills through study or apprenticeship, others were born with magical abilities. Some magicians and wizards now understood to be fictional, such as the figure of Merlin from the Arthurian legends, were once thought of as actual historical figures. While modern audiences often view magicians as wholly fictional, characters such as the witches in Shakespeare's Macbeth and wizards like Prospero from The Tempest, were often historically considered to be as real as cooks or kings. Wizards, who are often depicted with long, flowing white hair and beards, pointy hats, and robes covered with "sigils" (symbols created for a specific magical purpose), are often featured in often featured in fantasy novels and role-playing games. The wizard Gandalf in J.R.R. Tolkien's Lord of the Rings trilogy is a well-known example of a magician who plays the role of mentor, much like the role of the wizard in medieval chivalric romance. Other witches and magicians can appear as villains, as hostile to the hero as ogres and other monsters. Wizards and magicians often have specific props, such as a wand, staff, or crystal ball, and may also have a familiar animal (an animal believed to be possessed of magic powers) living with them. There are significantly fewer female magicians or wizards in fiction. Female practitioners of magic are often called witches, a term that generally denotes a lesser degree of schooling and type of magic, and often carries with it a negative connotation. Females who practice high level magic are sometimes referred to as enchantresses, such as Morgan le Fay, half-sister to King Arthur. In contrast to the dignified, elderly depiction of wizards, enchantresses are often described as young and beautiful, although their youth is generally a magical illusion. The best-known type of magical practice is the spell, a ritualistic formula intended to bring about a specific effect. Spells are often spoken or written or physically constructed using a particular set of ingredients. The failure of a spell to work may be attributed to many causes, such as failure to follow the exact formula, general circumstances being unconducive, lack of magical ability, or downright fraud. "The Crystal Ball" by John William Waterhouse: using material for magical purposes; besides the crystal, a book and a wand. Another well-known magical practice is divination, which seeks to reveal information about the past, present, or future. Varieties of divination include: Astrology, Cartomancy, Chiromancy, Dowsing, Fortune telling, Geomancy, I Ching, Omens, Scrying, and Tarot. Necromancy, the practice of summoning the dead, can also be used for divination, as well as an attempt to command the spirits of the dead for one's own purposes. If we analyze the principles of thought on which magic is based, they will probably be found to resolve themselves into two: first, that like produces like, or that an effect resembles its cause; and, second, that things which have once been in contact with each other continue to act on each other at a distance after the physical contact has been severed. The former principle may be called the Law of Similarity, the latter the Law of Contact or Contagion. From the first of these principles, namely the Law of Similarity, the magician infers that he can produce any effect he desires merely by imitating it: from the second he infers that whatever he does to a material object will affect equally the person with whom the object was once in contact, whether it formed part of his body or not. Contagious magic often uses body parts, such as hair, nail trimmings, and so forth, to work magic spells on a person. Often the two are used in conjunction: Voodoo dolls, for example, use homeopathic magic, but also often incorporate the hair or nails of a person into the doll. Both types of magic have been used in attempts to harm an enemy, as well as attempts to heal. Another common set of categories given to magic is that of High and Low Magic. High magic, also called ceremonial magic, has the purpose of bringing the magician closer to the divine. Low magic, on the other hand, is more practical, and often has purposes involving money, love, and health. Low magic has often been considered to be more rooted in superstition, and often was linked with witchcraft. Practitioners of magic often have a variety of items that are used for magical purposes. These can range from the staff or wand, which is often used in magical rites, to specific items called for by a certain spell or charm (the stereotypical "eye of newt," for example). Knives, symbols like the circle or pentacle, and altars are often used in the performance of magical rites. Depending on the magical tradition, the time of day, position of the stars, and direction all play a part in the successful working of a spell or rite. Magicians may use techniques to cleanse a space before performing magic, and may incorporate protective charms or amulets. The purpose of magic depends on the type of magic, as well as the individual magician. Some, like Aleister Crowley, used magic to elevate the self and to join the human with the divine. The use of magic is often connected with a desire for power and the importance of the self, particularly in the case of wizards and occultist magicians. Other groups, like Wiccans, tend to be more concerned with the relation of the practitioner to the earth and the spiritual and physical worlds around them. Practitioners of magic attribute the workings of magic to a number of different causes. Some believe in an undetectable, magical, natural force that exists in addition to forces like gravity. Others believe in a hierarchy of intervening spirits, or mystical powers often contained in magical objects. Some believe in manipulation of the elements (fire, air, earth, water); others believe that the manipulation of symbols can alter the reality that the symbols represent. Many, including Crowley, have believed that concentration or meditation can produce mental or mystical attainment; he likened the effect to that which occurred in "straightforward" Yoga. In addition to concentration, visualization is often used by practitioners of magic; some spells are cast while the practitioner is in a trance state. The power of the subconscious mind and the interconnectedness of all things are also concepts often found in magical thinking. Viewed from a non-theistic perspective, many religious rituals and beliefs seem similar to, or identical to, magical thinking. The repetition of prayer may seem closely related to the repetition of a charm or spell, however there are important differences. Religious beliefs and rituals may involve prayer or even sacrifice to a deity, where the deity is petitioned to intervene on behalf of the supplicant. In this case, the deity has the choice: To grant or deny the request. Magic, in contrast, is effective in and of itself. In some cases, the magical rite itself contains the power. In others, the strength of the magician's will achieves the desired result, or the ability of the magician to command spiritual beings addressed by his/her spells. The power is contained in the magician or the magical rites, not a deity with a free will. 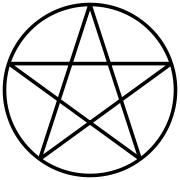 The pentagram within a circle; a symbol used by many Wiccans. While magic has been often practiced in its own right, it has also been a part of various religions. Often, religions like Voodoo, Santeria, and Wicca are mischaracterized as nothing more than forms of magic or sorcery. Magic is a part of these religions but does not define them, similar to how prayer and fasting may be part of other religions. Magic has long been a associated with the practices of animism and shamanism. Shamanic contact with the spiritual world seems to be almost universal in tribal communities, including Aboriginal tribes in Australia, Maori tribes in New Zealand, rainforest tribes in South America, bush tribes in Africa, and ancient Pagan tribal groups in Europe. Ancient cave paintings in France are widely speculated to be early magical formulations, intended to produce successful hunts. Much of the Babylonian and Egyptian pictorial writing characters appear derived from the same sources. Traditional or folk magic is handed down from generation to generation. Not officially associated with any religion, folk magic includes practices like the use of horseshoes for luck, or charms to ward off evil spirits. Folk magic traditions are often associated with specific cultures. Hoodoo, not to be confused with Voodoo, is associated with African Americans, and incorporates the use of herbs and spells. Pow-wow is folk magic generally practiced by the Pennsylvania Dutch, which includes charms, herbs, and the use of hex signs. While some organized religions embrace magic, others consider any sort of magical practice evil. Christianity and Islam, for example, both denounce divination and other forms of magic as originating with the Devil. Contrary to much of magical practice, these religions advocate the submission of the will to a higher power (God). Anthropologists have studied belief in magic in relationship to the development of cultures. The study of magic is often linked to the study of the development of religion in the hypothesized evolutionary progression from magic to religion to science. British ethnologists Edward Burnett Tylor and James George Frazer proposed that belief in magic preceded religion. Sigmund Freud's 1913 work, Totem and Taboo, is an application of psychoanalysis to the fields of archaeology, anthropology, and the study of religion. Freud pointed out striking parallels between the cultural practices of native tribal groups and the behavior patterns of neurotics. In his third essay, entitled "Animism, Magic and the Omnipotence of Thoughts," Freud examined the animism and narcissistic phase associated with a primitive understanding of the universe and early libidinal development. According to his account, a belief in magic and sorcery derives from an overvaluation of physical acts whereby the structural conditions of mind are transposed onto the world. He proposed that this overvaluation survives in both primitive people and neurotics. The animistic mode of thinking is governed by an "omnipotence of thoughts," a projection of inner mental life onto the external world. This imaginary construction of reality is also discernible in obsessive thinking, delusional disorders and phobias. Freud commented that the omnipotence of such thoughts has been retained in the magical realm of art. The well-known anthropologist Bronislaw Malinowski wrote The Role of Magic and Religion in 1913, describing the role magic plays in societies. According to Malinowski, magic enables simple societies to enact control over the natural environment; a role that is filled by technology in more complex and advanced societies. He noted that magic is generally used most often for issues concerning health, and almost never used for domestic activities such as fire or basket making. Cultural anthropologist Edward E. Evans-Pritchard wrote the well-known Witchcraft: Oracles and Magic among the Azande in 1937. His approach was very different from that of Malinowski. In 1965, Evans-Pritchard published his seminal work Theories of Primitive Religion, where he argued that anthropologists should study cultures "from within," entering the minds of the people they studied, trying to understand the background of why people believe something or behave in a certain way. He claimed that believers and non-believers approach the study of religion in vastly different ways. Non-believers, he noted, are quick to come up with biological, sociological, or psychological theories to explain religious experience as illusion, whereas believers are more likely to develop theories explaining religion as a method of conceptualizing and relating to reality. For believers, religion is a special dimension of reality. The same can be said of the study of magic. Magic and magicians are often represented as evil and manipulative. Part of this may have to do with the historical demonization of magic and witchcraft, or, more simply, people's fear of what they do not understand. Many make a distinction between "black" magic and "white" magic; black magic being practiced for selfish, evil gains, and white magic for good. Others prefer not to use these terms, as the term "black magic" implies that the magic itself is evil. They note that magic can be compared to a tool, which can be put towards evil purposes by evil men, or beneficial purposes by good people. An axe is simply an axe; it can be used to kill, or it can be used to chop firewood and provide heat for a mother and her child. While there have been practitioners of magic that have attempted to use magic for selfish gain or to harm others, most practitioners of magic believe in some form of karma; whatever energy they put out into the world will be returned to them. Wiccans, for example, often believe in the Rule of Three; whatever one sends out into the world will be returned three times. Malicious actions or spells, then, would then hurt the sender more than the recipient. Voodoo dolls, often represented as a means of hurting or even killing an enemy, are often used for healing and good luck in different areas of one's life. ↑ David Levi Strauss, Magic and Images/Images and Magic, The Brooklyn Rail. Retrieved June 15, 2007. ↑ Maurice Bloomfield, Hymns of the Atharva-Veda, Sacred-texts.com. Retrieved May 21, 2007. ↑ Stephan Williamson, The Real Magi (Wise Men) and the True Star of Bethlehem. Retrieved May 21, 2007. ↑ Laurel Holmstrom, Self-identification with Deity and Voces Magicae in Ancient Egyptian and Greek Magic. Retrieved May 21, 2007. ↑ Magikal Melting Pot, History of Magick. Retrieved May 21, 2007. ↑ Stephan Hoeller, On the Trail of the Winged God: Hermes and Hermeticism Throughout the Ages, Gnosis.org. Retrieved May 21, 2007. ↑ Occultopedia, Agrippa Von Nettesheim, Heinrich Cornelius. Retrieved July 24, 2007. ↑ Thelemapedia: The Encyclopedia of Thelema and Magick. ↑ The Mystica, Hermetic Order of the Golden Dawn. Retrieved May 21, 2007. ↑ Mysterious Britain, The Golden Dawn. Retrieved July 24, 2007. ↑ George Knowles, Gerald Brosseau Gardner (1884-1964). Retrieved May 21, 2007. ↑ Sir James George Frazer, Sympathetic Magic: The Principles of Magic, The Golden Bough. Retrieved May 22, 2007. ↑ Catherine Beyer, Definition: Ceremonial Magic, Wicca for the Rest of Us. Retrieved May 22, 2007. ↑ Barthelemy Comoe-Krou, Play and the Sacred in Africa—People at Play, UNESCO Courier. Retrieved June 15, 2007. ↑ Michael Arbuthnot, Article Review: The Role of Magic and Religion. Retrieved June 15, 2007.
de Givry, Grillot. 1954. Witchcraft, Magic, and Alchemy. Frederick Pub. Evans-Pritchard, E.E. 1937. Witchcraft, Oracles and Magic Among the Azande. Clarendon Press. Frazer, J. G. 1911. The Golden Bough. London. Kampf, Erich. 1894. The Plains of Magic. Konte Publishing. Kiekhefer, Richard. 1998. Forbidden Rites: A Necromancer's Manual of the Fifteenth Century. Pennsylvania State University. ISBN 0-271-01751-1. Thomas, N. W. 1911. "Magic." Encyclopedia Britannica. Wrede, Patricia. "Magic and Magicians." Fantasy Worldbuilding Questions Retrieved July 24, 2007. This page was last modified on 7 August 2018, at 18:00.